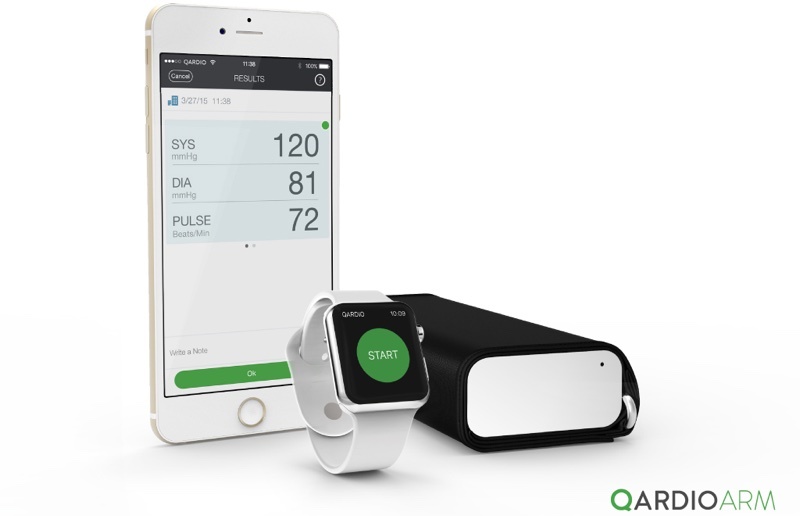 Qardio, known for its line of connected health products, today announced that it is expanding its partnership with Apple, a move that will see Apple Stores around the world offering the QardioArm smart blood pressure monitor. The QardioArm, which is priced at $99, is an FDA approved blood pressure monitor that's able to interface with an iPhone, iPad, or Apple Watch to help users keep an eye on their blood pressure. It was the first medical device available via Apple Health, and it's designed to make it simple for users to share data with health professionals. "We're thrilled to expand our global retail presence in collaboration with such a visionary retailer," says Alexis Zervoglos, Chief Business Officer at Qardio. "We share with Apple an absolute belief that purity of design coupled with technological innovation drives change, as we focus on creating beautiful, accessible products that lead to a healthier world without compromising lifestyle." QardioArm is available from Apple's online store and from Apple retail locations starting today. It's priced at $99 in the U.S., £99 in the UK, and €129 in other European countries. I have one of these. It works great (seems to be within range of what the doctor shows) and helps keep me on top of my blood pressure, which starts at a younger age in my family. It stores all of the readings in the app, and transfers them to HealthKit, which can be read by other health apps and shared with my doctor. This, combined with my Weight Gurus bluetooth scale, Apple Watch and AirPods (I get bored easily) have really helped get me back on track. My uncle recently passed away at age 53 of what we think was a massive heart attack (autopsy report is coming soon), and I don't want to end up like him in another 20+ years. So I'm really embracing technology to help me stay on top of my health every day and making it a part of my daily routine. He had begun making big improvements to his health several years ago—he was quite trim and muscular—but it was apparently too late for him. My grandpa on the other side of my family also had a heart attack with a quadruple bypass when he was 47, but he turned his health around and is doing pretty well today at 70. I'm the type of guy who really likes diving into numbers and figuring out patterns and tweaking things to see how the result changes, so I'm really excited that we're moving into an era where nearly every aspect of our health will be measured so we can be more proactive about our health. I got one of these from Amazon recently and I like it. Gives me readings that are a lot closer to what I get at the doctor's office than I got from the older Omron monitor I had been using. I also like the way it folds up so compactly, another big plus over the Omron. I also got one of these from Amazon UK back in January on a special offer at £80. I really like it - both my wife and I track our blood pressure daily with it (my wife has heart issues complicated by high BP). Warning: if your blood pressure isn't high before you try this, just wait till you try to get the blasted thing out of its packaging! Seems the same as the Withings (I think Nokia bought them though) Blood Pressure Monitor that my mother has used with Apple Health for over a year now, so not sure why this is being referred to as the first to medical device to integrate with Apple Health. The article just notes that they are expanding their agreement to sell this in the stores around the world. It has been there for a long time and "was" the first at the time a few years ago. It's been in the UK online store for a while, I bought one a few weeks ago. It works well and is useful considering my doctor said my blood pressure was a little on the high side. Is the news that this is now in the physical stores or is it rolling out to more countries? I have one of these, as well. I've had it for over a year now and it works well. Readings are on par with what I get at the doctor's office and the data integrates with the Health app, as well. I'm pleased with it.